Back in 1980 & 1981, a fledgling children’s TV network called Nickelodeon ran a series entitled Video Comics. Each episode, a DC comic was read to the audience while panels were shown on-screen. Some stories included were Adam Strange, Nutsy Squirrel, Sugar & Spike, and Swamp Thing. The live-action opening showed kids arriving at a store to buy comic books. Watch the video embedded below and look carefully around the 10 second mark! Click here if you can’t view the video below. Here is a screen shot from those opening credits featuring some dude with his hair on fire! According to the Director, there were roughly 70 comics read for the series. Very little information exists on the internet about this series. 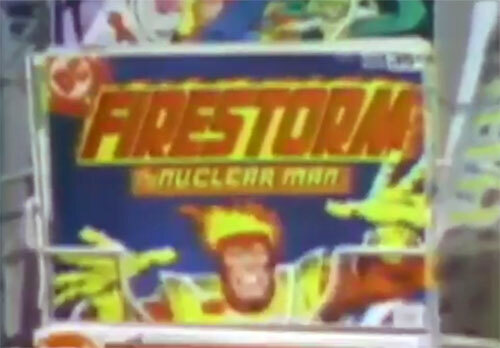 Therefore, we have no way of knowing if Firestorm was one of the comics featured. I never watched this series myself, but it looks like so much fun! You can watch an episode right now featuring Swamp Thing by clicking here! Neat! My thanks to Rob Kelly of The Aquaman Shrine for the heads-up on this series! Thanks, Aqua-rob! Posted in: Firestorm comic vol. I.
Comics on tv? You Can’t Do That On Television! Oh, and i wanna time travel back to that spinner rack and buy everything on that sucker! I watched this show when it was on. All of the comics that were read, were from 60’s early 70’s DC comics such as, The Flash, Green Lantern, Swamp Thing, Adam Strange, some character named I think ultra (? ), Sugar and Spike and random pulp sci fi stories. I do not recall anything stories with Firestorm. And The New Teen Titans for the second (fourth?) season. They also read The New Teen Titans circa 1980-1981. How do I know this? Two friends of mine, Tenshi (she was born to hippie parents) and Liz, told me so. The classic Green Lantern story where he flies into a sign was read as well.